EDITOR’S NOTE: This interview originally ran September 12th 2012. We present this encore edition to mark the news that Carney has just resigned his White House Press Sec. post, with a lengthy, never-before published exchange about 9/11 wherein Carney speaks at length about being on Air Force One as a reporter for TIME Magazine on that day. BY JONATHAN VALANIA Back in the spring, MAGNET’s collective jaw dropped when we learned that White House Press Secretary Jay Carney declared, in the middle of a briefing with the Washington press corps, that Guided By Voices was “the greatest rock band of the modern era.” It’s not often that our musical tastes intersect with those of the spokesperson for the most powerful man on the planet, so we dropped Carney a line and asked if he’d be willing to sit for an interview about his love of Bob Pollard and Co. Surprisingly enough, he said yes, and we found ourselves in the East Wing of the White House grilling the President of the United States’ spokesman about the finer points of Bee Thousand and Alien Lanes. JAY CARNEY: I did, I did. MAGNET: … referring to the song from Alien Lanes. The reason I bring all this up is that nobody in that room got this reference, but we did, sir, and the question is, why doesn’t MAGNET have a permanent seat in that briefing room? 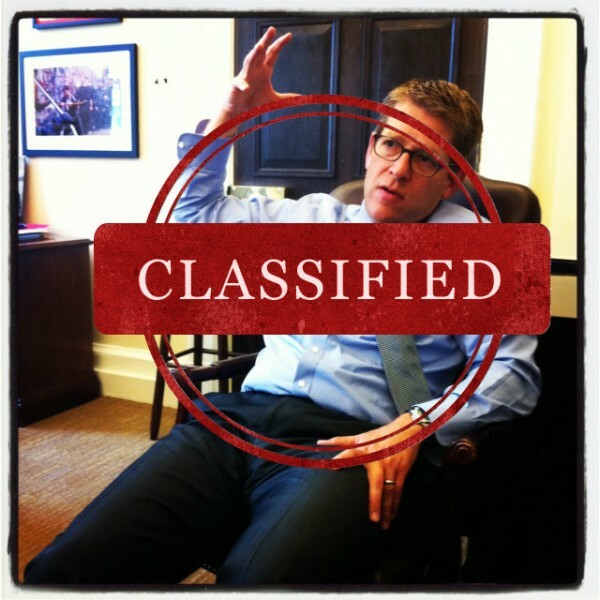 JAY CARNEY: I hereby approve your application for a permanent seat in the briefing room. JAY CARNEY: I think you’ve earned it by recognizing all of my Guided By Voices references and appreciating them, because I can say, in this job, I get to make my views known in a way I never was able to as a regular reporter for Time magazine, and it’s been especially nice to be extremely declarative about my musical preferences. MAGNET: My first proper question is a hypothetical: The flying saucers land on the front lawn, and they come down the gang plank and say, “What is this Guided By Voices that the White House press secretary is always talking about?” What is the one song that you would play them to set them straight? JAY CARNEY: I think “Echos Myron.” Because it might be the perfect pop/rock song. At least since the Beatles broke up, and the reason why I have so much affection for that song is both its perfection and because when I saw GBV at Irving Plaza in ’96 with my GBV buddies, there was a moment in the show—which was the best GBV show I have ever seen—when toward the end they played that, and there was so much extreme happiness there. It was just a perfect moment, a perfect rock ‘n’ roll moment. I just think it’s a fantastic song, and it’s emblematic of the so-called classic lineup’s capacity to take a simple song and make it unforgettable. MAGNET: I’ve actually had that exact same experience that you’re talking about. It’s a very joyful song. On a related note, another hypothetical: Your house is on fire. God forbid, you only have time to grab one GBV album. Which one do you take with you? JAY CARNEY: That’s hard. And I won’t cheat by choosing some of the later greatest-hits collections. I would say Bee Thousand. MAGNET: I would agree with you on that. OK, Tobin Sprout/Mitch Mitchell era or the Doug Gillard era? JAY CARNEY: Hands down, nothing against the Doug Gillard team, but Tobin and Mitch. MAGNET: Well, I’ll help you out here. The judges would have accepted “a song I have never heard and surely hope I never do.” Moving on, has the GBV song “Game Of Pricks” taken on a special resonance given your current vocation? JAY CARNEY: [Laughs] Well, I hadn’t thought of it before in that context, but I will never think of it otherwise now. MAGNET: Are you listed in the Goldheart Mountaintop Queen Directory? JAY CARNEY: Absolutely. If diehard fans are listed in that directory, I’m in there. MAGNET: Have you ever kicked an elf? MAGNET: Have you ever met a non-dairy creamer explicitly laid out like a fruitcake with a wet spot bigger than a Great Lake? JAY CARNEY: Not that I remember. MAGNET: We need to know: How does the president come down on the great Bee Thousand-vs.-Alien Lanes debate? MAGNET: Last question, this is actually a little bit more serious, You were on board Air Force One with President Bush when 9/11 went down. I’m curious what you remember from that day. MAGNET: Right, everything was grounded. JAY CARNEY: And I remember landing in, as we were coming into Andrews, you could see the smoke rising from the Pentagon, getting into town and seeing military police on the streets here and my wife was pregnant with my son, eight months pregnant, and she was anchoring, she was doing, she was the news reader for Good Morning America, and since she was pregnant, SO pregnant she couldn’t travel to New York, so she was doing it at a space that ABC had at the Haight Adams [Hey Adams? ], across Lafayette Park, with the backdrop of the white house, and as she was news reading, as they were wrapping up the show at 9:00, Charlie Gibson said, “Claire is that smoke?”—they weren’t wrapping up, y’know, the towers had been hit and then they were, Charlie Gibson noticed that behind Claire in a long shot there was smoke behind her, and that was the Pentagon, and that another plane had struck the Pentagon. Anyway, I came looking for my wife at the Haight Adams and it was, like everybody, an unforgettable day. This entry was posted on Friday, May 30th, 2014	at 12:16 pm	and is filed under News	. Responses are currently closed, but you can trackback from your own site.